There are several ways I can tell that Helfe Ihnen’s DEsign Island has become my favorite sim in all of Second Life. First, I’ve been collecting batches (literally hundreds) of screenshots over the course of several weeks now, with the ongoing intention of doing a major post about the sim. But every time I gear up to write it, I discover a new aspect of it that needs coverage. To do this right will take time, lots of time, lots of screenshots, lots of Q&A with Helfe. This should be a magazine article, or a chapter in a book, not a blog post. I’ve even plotted massive machinima pieces. I was going to start the shot on Pong Blumenthal’s sound installation – picking up on those excellent beats, then gradually pan over to the ‘Cloud’ build (inspired by Architectur from Coop Himmelb(l)au, Cloud, 1968). I couldn’t miss the Sub-Club, among the coolest SL lounges I’ve seen to-date. Then I’d pan up to that incredible museum installation in the sky (I still need to ask Helfe what that’s all about – its very intriguing!). Every corner of this sim requires your attention. Now we realize a very special experiment: “Spatial City” the great conceptual, experimental architecture of Yona Friedman. A city on multi levels, on which the inhabitants build there homes. 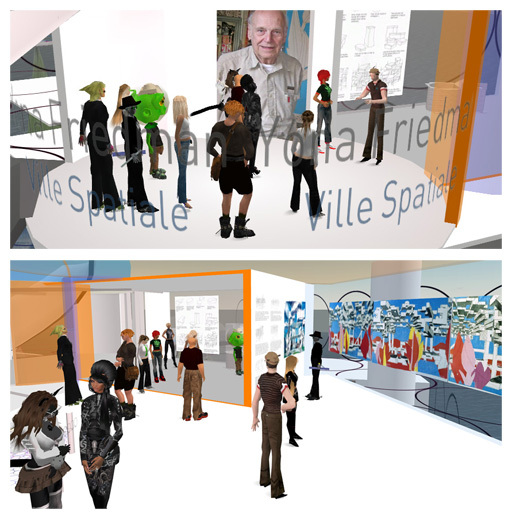 Two of the best skills of Second Life help us with this: 3D building and social community buildingA living modell of Yona Friedmans “Spatial City” on DEsign Island will be made by the interested avatars themselves. A three level structure planned by Yona Friedman and builded by “Helfe Ihnen” with the help of “Marianne Sewell” is the beginning. Helfe was brilliant in executing and honoring Yona’s ideas and work in this build. By offering avatars a place to ‘live’, within the auspices of Yona’s visionary ‘Spatial City,’ he is building on the 3D building aspects of Second Life, creating a meaningful experience, and reinforcing the community building phenomenon SL affords all at the same time. This build has certainly become a catalyst for a thriving community of architects, artists and designers who have customized spaces within the City, and has quickly become a thriving and vibrant place to be. I was recently commissioned to build a residence for Archis Writer, an architectural historian who now lives in Spatial City. I can barely rez a prim without meeting some fascinating and curious neighbor who invites me on a journey to see what they’ve just built – which leads to another introduction, and another… ahhh, such is a Second Life! Never a dull moment. This place is alive. The only way to fully appreciate it is to visit, explore and perhaps even live in Spatial City. You’ll find it HERE.